Nottingham Forest boss Dougie Freedman says it is "touch and go" whether Henri Lansbury will play again this season after suffering an ankle injury. 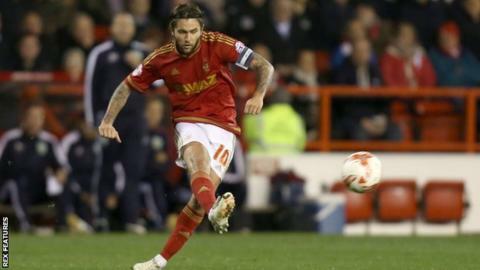 Lansbury was taken off on a stretcher in the second half of Forest's FA Cup third-round win over QPR on Saturday. The 25-year-old has scored 25 goals in 124 appearances for Forest since signing from Arsenal in 2012. "From the X-ray it's not a break, it's ligament damage," Freedman told BBC Radio Nottingham. "How much ligament damage? He needs an MRI scan. "The early signs are a lot better than we first feared but it's still touch and go for the rest of the season."